The crest of the worldwide Augustinian Order depicts a heart on fire, pierced with an arrow. This shows the passionate restless heart of St. Augustine, a heart that is open to the pain and joy of loving and the extension of God’s love into the mission and ministry of Augustinian priests, brothers, sisters and their lay friends. The open book in the crest represents the Bible which was the inspiration of St. Augustine’s life. Throughout history, the shape and form of the crest has evolved from the more ornate presentation to simpler modern reproductions. Apart from the common symbols of the heart aflame, the piercing arrow and the book, other historical elements include a cincture, a bishop’s crosier and mitre, a banner with the Latin words “Tolle Lege”, Take up and Read. Above the main door of the church on O’Connell St., a large stained glass window depicts scenes from the life of St Augustine. 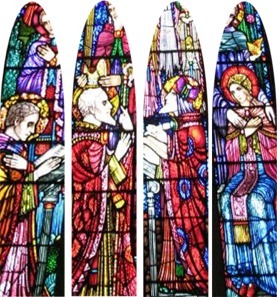 The window shows (from left to right) his conversion, his consecration as a Bishop, writing his confessions and the Transfiguring Experience with his mother Monica.The window is dedicated to the memory of Fr Joseph Hennessey who was the main driving force behind the building of the church. Above the four main sections of the stained glass windows, are the symbols of the four Evangelists of the four Gospels which are (from left to right) the bull (Luke), the man (Matthew), the eagle (John) and the lion (Mark). If you would like more information about St. Augustine’s Church and the Augustinian Community in Limerick, please submit the contact form and we will contact you with more details.